In a city where it seems nearly impossible to take a short break from your day, that’s probably exactly what you need. Now you can find your zen while commuting. The Be Time bus is the first mobile mediation studio to come to NYC and will begin rides tomorrow (Mon. Jan. 22). To celebrate its launch they will be offering free sessions on Monday from 8 a.m. and 2 p.m. in front of Madison Square Park. 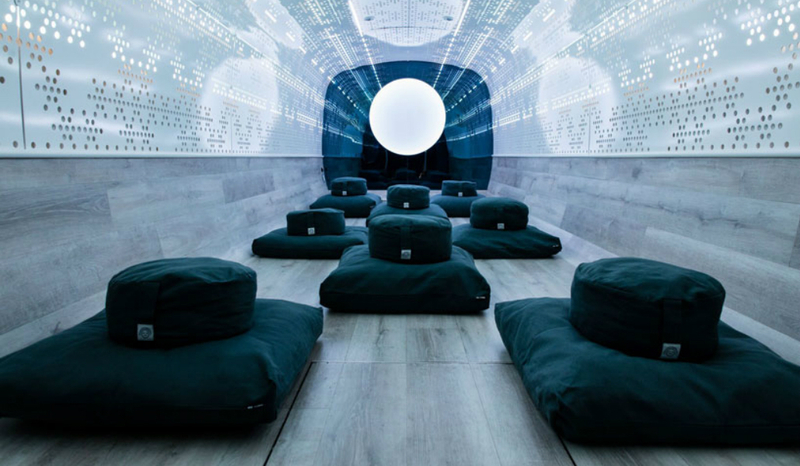 The bus is big enough to fit about 10 people comfortably, with cushions to sit on, aromatherapy, sound insulation, amazing LED lights, and futuristic looking laser cut wall panels to help soothe your mind as you meditate across the city. There’s only one bus at the moment, so it will change locations to give everyone a chance to catch a break from the hectic city streets. Since its location will be constantly changing you’ll want to check Be Time’s Instagram (@betimepractice) for updates. After the free sessions on Monday, your first time for a 30-minute class will cost $10. After it’ll be $22 per class, with packages offered for 5 classes at $99, or 10 classes for $190.